Morro Bay – a well deserved rest! We left Avila Beach soon after and headed towards Morro Bay. Mats was still asleep, when we got off the mooring and steered into the fog. Around 10 am we turned the motor off and pulled the jib out. We made 5 knots down the swell, the jib was not able to compete. It was not comfortable and the closer we came to Morro Bay, the thicker the fog appeared. The Captain rolled the jib back in. We were not able to see much at all, just the sound of the fog horns here and there. We watched our navigation system and Navionics carefully. Our senses were wide awake! There was no space at the pier of the friendly Yacht Club for us. We first docked at a temporary station and than found out, that the Yacht Club was able to give us a mooring. We picked one which was closest to the Yacht Club, indeed a very short rowing distance. We received keys for the showers and soon after took advantage of it, before heading out for dinner. The sunsets were amazing and we just took it easy for a few days. Went to the beach, worked on some blogs and also the bank machine ate my card. Thank you, bank machine. It’s nice that you will send me a new one in only a few days. Well, I am not home just yet. Morro Bay is a cute little town. We liked it and collected some strength for the next passage to Monterey. Author Simply Dog WalkPosted on November 5, 2018 November 2, 2018 Format LinkLeave a comment on Morro Bay – a well deserved rest! First a little clip about our windy sail from Santa Barbara to the Cojo Anchorage. The last possible stop before heading passed Pt. Conception. A good possibility to seek shelter or break up the passage. Here we come! As soon as we saw a little bit of light, we made our way out through kelp fields to motor passed Pt. Conception. This is the forecast we had the night before. Even some south winds, but overall very light. Looked like we would have a lot of motoring ahead of us, but no battle against the usual north winds. The sunrise was beautiful and I was aware, that this might be one of the last ones I would watch from being in the ocean on our sailboat for a while. But the thought of “home” and what we had accomplished so far, made it a sweet one. Pt Conception was surrounded by fog and soon we would motor right into it. After lots of hours motoring, we were able to start sailing. Another boat popped out of the fog and it was a nice token knowing having one around on this passage. We noticed that they were watching something…. There were lots of splashes in the water, at first the owners were watching but all of a sudden they turned there boat around. Not sure what had happened there, maybe a crab pot. We had seen many ourselves and had to watch out sharp. Soon it was us having company! We arrived at Avila Beach around 3:30pm. Managed to get a water taxi to shore and took our rowing dinghy deflated with us, as it was the last taxi for the day. We were exhausted from an early morning start and did not want to row both ways. There was a nice lady who let us store our dinghy-package before heading to town. We took a shower first and than found a playground and some ice-cream for Mats. When we got back to the dock, we inflated the dinghy and had quite a long row ahead of us. What a day. We were all glad, when we hit the pillows! A mile stone was lying behind us. Since we had left Catalina island, we had started watching weather around the Pt Conception area. We were in no rush to get home to foggy San Francisco Bay and thought we would stay a little bit in Santa Barbara. The Captain had a lot of fun in SB when we were on the way to Mexico a year back, as there is a surf break close to the Marina he was able to paddle to. Santa Barbara is also very pretty and fun for everyone. But first we wanted to check out Channel Island Harbor. We heard about free usage of a pool and that was tempting. Our ice-run fridge needed a refill, so we left cool Malibu beach and headed to our next destination. There wasn’t much around in walking distance, but being able to hang out at the pool at an apartment complex and taking care of laundry, was worth staying 2 days. And then there was this great weather window coming up. We had watched it for a while now and since forecasts sometimes change rapidly, we were cautious to make a decision. But that window started looking really good and that on different weather apps. So we headed to Santa Barbara the next morning. Passed oil rigs and even caught a little Mackerel. He was too tiny to keep and we wanted him to enjoy his life. We let him free again. Our stay in Santa Barbara was short. We arrived around 2pm in blazing heat. Luckily they had a spot left for us, a race was happening that evening. Once again we checked the weather and given the fact that Pt Conception is a rough one, we couldn’t pass it up to ditch our planned stay at Santa Barbara, but use the weather to have an uncomplicated passage. Yeah, isn’t it crazy that a storm in one area creates a good window in another? Due to a nice guy we met on the dock, we were invited into the Yacht Club, had a cold beer and watched the race, where Sailboats appeared ghost-like through fog clouds. Even though we didn’t have a lot of time, we made the most out of it. Our plan was to sail to the Cojo Anchorage right around the corner of Pt. Conception and sleep until sunrise. We arrived at sunset, picked our way around kelp fields and anchored. It was a nice evening and we were happy to be able to get some rest and especially that the forecast held up with even some south winds. Pt Conception, we are ready for you. Author Simply Dog WalkPosted on October 18, 2018 October 18, 2018 Format LinkLeave a comment on Race with WEATHER! When we left Marina del Rey in the morning, we did not know if we would stop in Malibu Beach or had to continue to Channel Island Harbor. We heard about lots of kelp in the anchorage and wanted to decide once we got there. After sailing for hours in lots of wind, I was hoping we would be able to anchor and the Captain, looking at the surf break, was most likely as well. It took a bit of circling until we found a spot which seemed somewhat ok, we still saw kelp in lots of spots around us. The Captain let the anchor down in what seemed like a good location, let it set and after his signal I put the gear in reverse. The anchor grabbed the ground very well. We prepared for a beach day and the Captain wanted to go to a different beach this time. When we got closer, I saw that the shore break seemed bigger than where had landed the day before. I tried to point out, that we might be better of changing plans, but no agreement there. I had Mats on the SUP in front of me, Evan was rowing the air dinghy with Noah inside. When it seemed like the right moment, I let Mats in the water to swim ashore (he really wants to do that, as he is afraid of shore break and does not want to be in the dinghy) and paddled hard. I made it to the beach fine, ran the board up on the sand and swam towards Mats. I had let him out a bit early, so he had quite a bit to swim. All went well, a wave came and I held him high up. Noah did not get quite that lucky. He swam, was pulled back right into a breaking wave just when I had him by the collar. I pulled him towards the shore and helped him out of the water where Mats took over. Now it was the Captains turn and he had to wait quite a while as a big set of waves smashed onto the beach. I did not like all of this at all. But he made it. It was hard for me to relax afterwards, as I knew, we had to get back out at one point. It was super hot at the beach, we found a nice shady spot for Noah and the Captain went surfing. Our neighbors at the beach had a huge shade structure, which they hadn’t set up yet. We helped and they were so kind to share it with us. Mats had a great time playing and found some kids to share toys. When it was time to get back to the sailboat, I watched the water, picked a good time and paddled as fast as I could with Mats sitting right in front of me. I was so happy! The Captain did a great job as well and once again, I was hoping that that was the last surf break we had to conquer before returning home! The Sail from Catalina Island to Marina del Rey was fast and a bit uncomfortable. Pulling into the channel it sure was pretty! After a bit of remoteness, feelings are mixed about getting back into civilization. But we had spent a good 10 days on Catalina Island and slowly wanted to move towards San Francisco. We found a fair priced Marina by the Burton Chace Park and went for a stroll. Mats was happy to ride his bike again and we all enjoyed a hot shower. In the evening we went to explore more of the area and started being very hungry. Mats did not want to ride his bike anymore, so we stopped at a fish restaurant. The food was simply not good! A bit disappointed and after Mats had some ice-cream, we started our long walk back to the boat. It’s hard to beat the happy hour at Seafood Peddler in Sausalito or the fresh fish in Mexico. But man, that restaurant was bad. The next day was my birthday and we took an Uber to Venice Beach! It was a lot of fun. We rented some bikes and cruised from Venice Beach to Santa Monica. Of course we did a stop at Muscle Beach, watched some street artists and finished a beautiful day at a nice restaurant with self brewed beers. The next morning we were off sailing to our next destination: MALIBU BEACH! San Francisco Bay sailing charters! Experience fast, action-packed exciting sailing, or we can slow things down for a leisurely cruise on the Bay. We offer private sailing charters so you get to choose! Our rate is $95/hour for the boat, for up to six people. We recommend a three hour tour. Bring beers/wine and snacks if you wish. We depart from Sausalito, with free parking available. San Francisco pick-up and drop off may be possible upon special request. Get a taste for what an awesome experience living, working and voyaging on a classic sailboat can be. Get a little salty while we sail and chat about what it’s like going far from land and crossing oceans, from endless waves and wind, to calm nights under starry skies. Get a feel for what it’s like to live and thrive in a constantly moving small space, in a beautiful but unforgiving environment. Hear what it’s like to battle land Tuna, Mahi Mahi and Sailfish while under a full spread of sail and have the freshest sushi minutes later, to anchor in tropical anchorages, bathe in the sea, and surf endless, uncrowded waves right from the boat. Ask as little or as much as you like about surviving storms, living in foreign countries, meeting great cruising friends, and unplugging from normal living to find another path. Spend time aboard a unique, rugged, beautiful boat with numerous Atlantic Ocean crossings and a Panama Canal transit under her belt, that has provided a safe and peaceful haven for her crew over the span of five decades. I’m passionate about voyaging and the sailing lifestyle, and living and working on boats around the world. 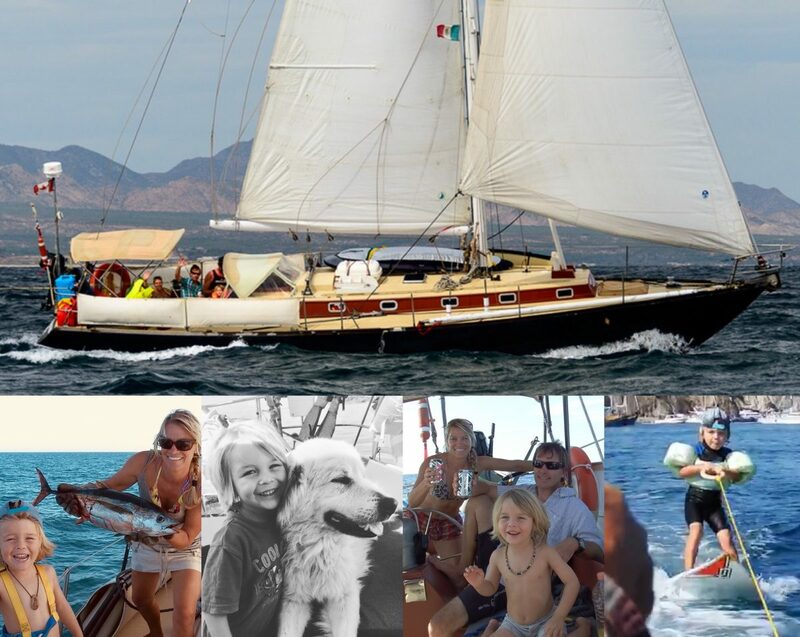 I grew up sailing and racing small boats, and I have just returned from a year long cruise in Alsager to Mexico’s Gold Coast and the Sea of Cortez with my wife, young son, and dog Noah on board. In the last year and half I have sailed over 10,000 miles, including a passage from Hawaii to Seattle. Prior to departing, I spent many years working around the world for America’s Cup Race Management, setting courses for the race yachts. I am licensed by the Coast Guard. Author Simply Dog WalkPosted on September 26, 2018 Format LinkLeave a comment on San Francisco Bay sailing charters!